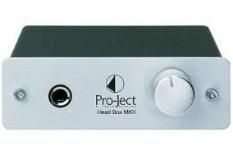 Pro-Ject Head Box MKII review | What Hi-Fi? 'Turn that flippin' music down now!' Banish those big-volume blues with a decent pair of 'phones and the Pro-ject Head Box MkII. If your amplifier doesn't have a headphone out, plug the Pro-Ject into a spare tape loop, and you're away. Even if you do have a 'phone out, the Head Box MkII sounds better, at least on sub-£500 kit.